Nidhogg 2 is one of the most entertaining 1v1 competitive games available. 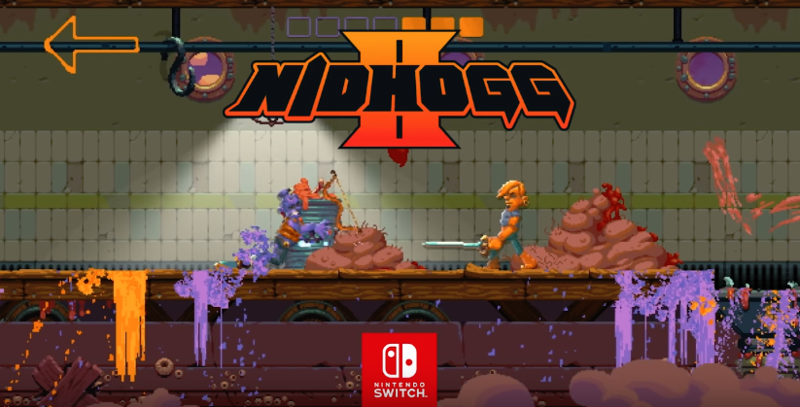 Those wishing to take the cartoonish and bloody game on the go will have their wish granted this November 22nd when Nidhogg 2 launches on Nintendo Switch. Judging from the trailer the game is a port without anything exclusive. Those hoping to use thing such as the Master Sword will be disappointed. For those unaware, Nidhogg is a 1v1 fighting game. Players kill one another and attempt to escape by running to the end of their own path. If killed the opposing player gets to run to their end until killed. First to reach the end wins. Since its launch, the game has been positively received by fans and critics. While it lacks diverse modes and has limited content the core gameplay is so strong that it still has a strong community of players. Nidhogg 2 is now available for PC, PS4, and Xbox One. Check out our review here.